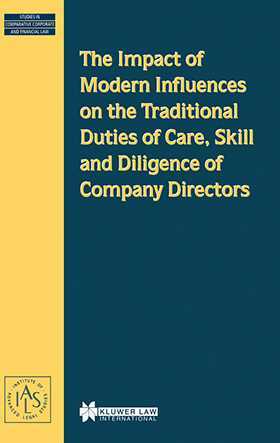 Although all are agreed that current commercial realities dramatically affect the duties owed by directors to their companies, there is as yet no consensus on what, if anything, should be done about it. Some urge reform, or at least modification, while others insist that the traditional standard which may be expressed generally as `such care as is reasonably expected, having regard to the director's knowledge and experience'--has the great merit of flexibility. In an initiative aimed at clearing this impasse, the English and Scottish Law Commissions have proposed a statutory formulation, on the grounds that this would at least bring more certainty and clarity to the applicable standards. This important book delves into the issues surrounding this debate, presenting the arguments for and against a statutory statement, with in-depth analysis of the various degrees of reform that could be brought to bear on the issue. through an analysis of recent UK legislative developments, particularly Section 214 of the Insolvency Act 1986 and the Company Directors Disqualification Act 1986. Practitioners and academics in company law, as well as thoughtful business people, will appreciate the depth and clarity of this analysis. Its clear-headed elucidation of a contentious issue is sure to move this important matter forward toward a timely and needed formulation, statutory or otherwise.